The agro-industrial complex is an important object in the agrarian economy of Kazakhstan. In the state programme for the agro-industrial complex development, the development of clusters as an economic agent is a priority. In our research we have examined to what extent the innovative direction in the formation of prospective national clusters of the Republic of Kazakhstan was realized (completed until 2020). The research showed that the technological policy lags behind the planned programme. For example, there was no increase in the innovative activity within the business sector. We also studied how the residual knowledge of the graduates of profession-oriented institutions affects the economic indicators of the agro-industrial complex. With the help of autocorrelation regression analysis (Pearson correlation coefficient -0.94), it was established that the low level of graduates' competence in 2008 was one of the factors of the total GDP decrease in agricultural output in 2012. At the same time, the improvement of the expertise level positively influenced the GDP– a positive trend was observed from 2015 to 2017. Agro-Industrial Complex, Clusters, Agrarian Education, Kazakhstan. The position of small holders in different agricultural food chains is determined by the relative profitability, rather than by the relative effectiveness of the small holder (Zoomers, 2010; Borras et al., 2012). Agro-business is characterized by intense competition, monopoly price control, marketing wars, financial investments, new technologies, as well as by logistical control and an increase in production scale (Newman, 2009; Lapavitsas, 2009). For example, competition in the pineapple industry has led to a decline in small-scale production in Ghana and the consolidation of vertical integration through transnational corporations. The collapse of small-scale production gave way to large estates and the production reorganization (Amanor, 2012). In Chile the state acts as a political intermediary in economic adjustments. It hastens collective learning, contributes to debates and provides direction and resources, assists and identifies their comparative indicators to the world standards (Perez-Aleman, 2000). The development of agro-industrial clusters combined with the growth of their scientific intensity and innovation takes place in the USA, Denmark, Finland, China and other developed countries. This creates a global trend toward clustering, which is based on the latest achievements in science and technology (Crescenzi et al., 2007; Zemtsov et al., 2016). Vertical integration has been a characteristic feature of Kazakhstan’s agro-industrial complex since 2001 (Drew, 2009). The main problems of the agro-industrial complex development in Kazakhstan are: technologically it lags behind the developed countries; slow rates of social development of rural areas, which determine the deterioration of the socio-demographic situation; ineffective training of qualification specialists in profession-oriented institutions (Tazhibaev et al., 2014). In 2014 the government launched the project "Diversification of Kazakhstan's economy through the cluster development" and revealed how this goal should be achieved. It must be achieved through the promotion of clusters, which is a specific form of industrial organization, in which firms and associated institutions are linked geographically in some way (Smagulova, 2016). Educational institutions should also consider the development of a training platform for future specialists, who are ready for new concepts and forms in the agro-industrial complex (Corcoran & Wals, 2004). In our research we have studied agro-industrial formations as economic agents, using the example of agro-industrial clusters. We have also analyzed the implementation of the innovative aspect, which was the main point in the concept of promising national clusters in the Kazakhstan until 2020. By means of autocorrelation of the time series, it was estimated how profession-oriented education affects the economic performance of the agro-industrial formations. The materials presented in this paper are based on the statistical data collected from the reports of the Ministry of Agriculture and Agency of Statistics of the Republic of Kazakhstan, as well as on the concept of the formation of promising national clusters in Kazakhstan until 2020 and Rating Agency. Additionally, the information from the books, scientific and statistical journals, laws and regulations of the regional and municipal authorities was used. The methodology is based on the comparative analysis of the effectiveness of agro-industrial clusters as economic agents in the Republic of Kazakhstan. The research is focused on the necessary components for the development of promising national clusters. We have also identified the interrelated components that should be included in the development of agro-industrial clusters (Figure 1). More attention was paid to the educational and innovative factors, since they are the least considered factors in the literature. The knowledge of future agronomists is one of the factors influencing the development of agro-industrial cluster formations. To assess it 2 questionnaires among graduates of agricultural institutions in Kazakhstan (technical schools, universities, colleges) specializing in crops and livestock were conducted. Each questionnaire consisted of 30 questions on principal subjects, as well as questions on entrepreneurship and management. Each question gave 3 points. 1. Clusters in industrial sectors based on the use of natural resources, which will form the core of the economy in the nearest future. 2. Service clusters that will strengthen Kazakhstan's position. According to the concept, the clusters of the agro-industrial complex consist of a cluster council under the chairmanship of the Minister of Agriculture of the Republic of Kazakhstan; members of the council: National Chamber of Entrepreneurs (branch association), branch scientific research institutes, AOE “Nazarbayev University”, AO "Management Company SEZ PIT", universities. The state policy of cluster development included a wide range of activities in the following areas: production and infrastructure projects, creation of institutional conditions for development, scientific and educational potential development, organizational support (concept). Let's consider how the direction of the country’s innovative development was realized. In the patenting activity Kazakhstan ranks 42 out of 141 countries. According to the National Scientific Portal of the Republic of Kazakhstan, from 2010 to 2014 503 patents in agriculture were issued. According to In Cites, 2011-2015, the contribution to the world agricultural science is 1.88. The review of the world market AgFunder (2015) showed that the leaders in the innovation are the USA, India and China. One of the goals of the economy modernization on the basis of cluster development was the creation of a platform for the introduction of innovative technological developments in the agro-industrial complex. But as it can be seen from the analysis, this task is only at an early stage. In the effective development of agro-industrial clusters the main role belongs to the state. The main efforts should be aimed at subsidizing, attracting investments, production modernization. The creation of clusters is also closely linked with the development programming for the regions as structure-forming elements. First of all, agriculture optimal pricing is needed for the agro-industrial complex development. One of the indicators of the effectiveness of agrarian clusters can be identified by the fact that since 2013 there has been a trend towards an increase in total GDP (Figure 2). It is a positive aspect that Kazakhstan is one of the world's leading exporters of grain and flour. The Republic ranks among the top ten suppliers of wheat to the world market and is the leader in export of flour. For example, in 2008-2012 the average annual volume of grain exports amounted to 8.2 million tons and increased by 2.5 million tons or 42.6% compared to the previous five-year period (data from the report of the Agricultural Statistics Committee). It is important to note that the dynamics of cluster management depends on the creation of institutions that act as bridges to improve cooperation between small and medium-sized enterprises in the context of poor infrastructure and institutions. In its turn this helps them achieve greater collective efficiency and gives the access to global markets (Mesquita & Lazzarini, 2008). Cluster policy should combine infrastructural support with the introduction of new organizational forms and communications. An important condition for the formation of effective agro-industrial clusters is the rapid introduction of modern technologies and the development of a new class of entrepreneurs with creative mind and behavior. Qualified specialists in entrepreneurial activity, agro-industrial and management spheres should work in agro-industrial enterprises to ensure effective functioning (Azis et al., 2018, Kuratko & Morris, 2018). In order to determine how many graduates of agricultural educational institutions possess this knowledge, we conducted a research. 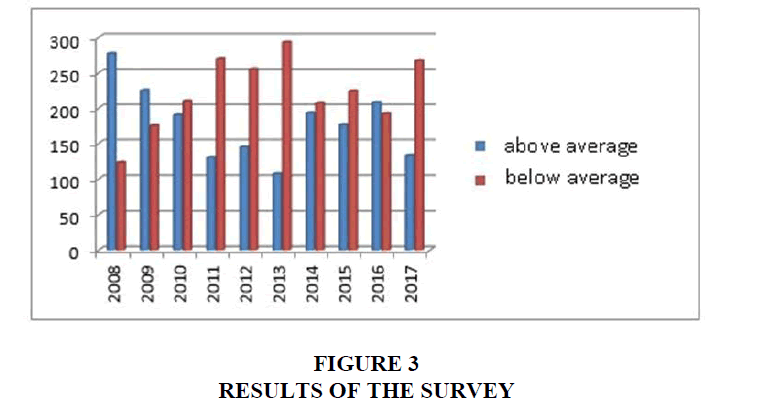 According to the questionnaire (Figure 3) from 2008 to 2010, the level of knowledge with “below average” performance was significantly higher. From 2011 to 2013, there is an upward trend in the competence of graduates. And from 2014 to 2016, the performance was almost at the same level, but 5% higher the “above average” (Figure 3). To analyze the influence, the time series auto-correlation model was used (Lichstein et al., 2002). Positive results of the survey and data on the GDP of crop production and livestock were selected for comparison (Figure 2). When analyzing, we took into account that the knowledge of graduates will be shown in entrepreneurial activity in 4 years. In the agro-industrial formations, agro-industrial clusterization is of particular importance, since it makes it possible to control the market at the regional and interregional level. In its turn, the state in its policy for the development of agro-industrial formations should: increase innovation and technology support, develop the scientific and educational potential of the younger generation, train creative specialists in entrepreneurial sector and form a modern basis for entrepreneurship development. Autocorrelation analysis showed that there is strong autocorrelation dependence between the level of academic training of graduates from agricultural institutions and economic indicators (Pearson 0.85). The results of the research showed that the level of specialist training affects the economic indicators of the agro-industrial complex, and the result of the work can be assessed in a four-year period. AgFunder. (2015). AgTech Investing Report. Amanor, K.S. (2012). Global resource grabs, agribusiness concentration and the smallholder: Two West African case studies. The Journal of Peasant Studies, 39(3-4), 731-749. Azis, M., Haeruddin, M.I.M., & Azis, F. (2018). Entrepreneurship education and career intention: The perks of being a woman student. Journal of Entrepreneurship Education, 21(1), 1-10. Borras, S.M., Franco, J.C., Gomez, S., Kay, C., & Spoor, M (2012). Land grabbing in Latin America and the Caribbean, Journal of Peasant Studies, 39(3-4), 845-872. Corcoran, P.B., & Wals, A.E. (2004). Higher education and the challenge of sustainability. Dordrecht: Kluwer Academic Publishers, 10, 1-306. Crescenzi, R., Rodr?´guez-Pose, A., & Storper, M. (2007). The territorial dynamics of innovation: Europe-United States Comparative Analysis. Journal of Economic Geography, 7(6), 673-709. Drew, J. (2009). The benefits for rail freight customers of vertical separation and open access. Transport Reviews, 29(2), 223-237. Dudin, M.N., Lyasnikov, N.V., Kahramanovna, D.G., Tursunovich, D.K., & Reshetov, K.J. (2015). Improving the Innovative Strategy of Interaction of Large Industrial Enterprises and Small Entrepreneurship in the Agro-industrial Sector. Biosciences Biotechnology Research Asia, 12(1), 159-167. Kuratko, D.F., & Morris, M.H. (2018). Examining the future trajectory of entrepreneurship. Journal of Small Business Management, 56(1), 11-23. Lapavitsas, C. (2009). Financialised capitalism: Crisis and financial expropriation. Historical Materialism, 17(2), 114-148. Lichstein, J.W., Simons, T.R., Shriner, S.A., & Franzreb, K.E. (2002). Spatial autocorrelation and autoregressive models in ecology. Ecological Monographs, 72(3), 445-463. Mathe, K.M. (2013). Agricultural growth and food security: Problems and challenges international. Journal of Research in Commerce, Economic & Management, 7(3), 131-137. Mesquita, L.F., & Lazzarini, S.G. (2008). Horizontal and vertical relationships in developing economies: Implications for SMEs' access to global markets. Academy of Management Journal, 51(2), 359-380. Ministry of National Economy of the Republic of Kazakhstan Agency of Statistics, for the period from 2008 to 2017. Newman, S.A. (2009). Financialization and changes in the social relations along commodity chains: The case of coffee. Review of Radical Political Economics, 41(4), 539-559. Perez-Aleman, P. (2000). Learning, adjustment and economic development: Transforming firms, the state and associations in Chile. World development, 28(1), 41-55. Report of the Minister of Agriculture Kurishbaev A.K. at a government hour in the Majilis of the Parliament of the Republic of Kazakhstan: On measures for ensuring the country's food security. RFCA Ratings/Rating Agency (2011). Analysis of the livestock industry in Kazakhstan. Smagulova, Zh. B. (2016). Prerequisites for the development of agricultural clusters in Kazakhstan. Fundamental Research, (3-2), 419-422. Tazhibaev, S., Musabekov, K., Yesbolova, A., Ibraimova, S., Mergenbayeva, A., Sabdenova, Z., & Seidahmetov, M. (2014). Issues in the Development of the Livestock Sector in Kazakhstan. Procedia-Social and Behavioral Sciences, 143, 610-614. The concept of formation of promising national clusters of the Republic of Kazakhstan until 2020, dated October 11, 2013 No. 1092. Tokolova, A.A. (2016). Clusters as a form of integration of the agro-industrial complex. Young Scientist, 6(5). 135-137. Vojnovi?, B., Stefanovi?, V., Vojnovi?, D., & Perovi?, M. (2014). Research on readiness for job creation through one’s own agribusiness startup. Economics of agriculture, 61(2), 397. Zavyalov, D.V., Saginova, O.V., & Zavyalova, N.B. (2017). The concept of managing the agro-industrial cluster development. Journal of Environmental Management & Tourism, 8(7), 1427-1441. Zoomers, A. (2010). Globalisation and the foreignisation of space: Seven processes driving the current global land grab. The Journal of Peasant Studies, 37(2), 429-447.